In early October of 2017, seventeen separate wildfires were reported to have broken out across Napa, Lake, Sonoma, Mendocino, Butte and Solano counties in California, one of which (The “Tubbs Fire”) would go on to be the most destructive wildfire in the history of California. These fires didn’t just grow, they grew rapidly, and over 210,000 acres of land were damaged forcing over 90,000 people to evacuate their homes, killing roughly 50 and hospitalizing about 200 people. The speed and unpredictability of the fires caused the majority of the deaths. This represents the largest loss of life due to wildfire in the US since the Cloquet Fire in Carlton County Minnesota in October of 1918. Within days air pollution was rampant, the Napa region was even at one point identified as having the poorest air quality in the country. Landmarks, wineries, restaurants, houses (thousands in Santa Rosa alone), apartment complexes and schools were among the structures which received extensive damage due to these fires. Anyone who is even remotely aware of the Bay Area music scene should not be surprised that altruistic measures were in motion even before the last fire was contained. One of these, a massive Metallica-headlined concert, was arranged and named “Band Together Bay Area” and set to raise money for the Tipping Point Emergency Fund. This fund provides short, intermediate and long-term relief for low-income families, immigrants and other fire victims. Many of these people may still be struggling to survive as you read this. The eclectic nature of the event reflected the rich, vibrant and varied musical culture for which San Francisco has been known for decades. 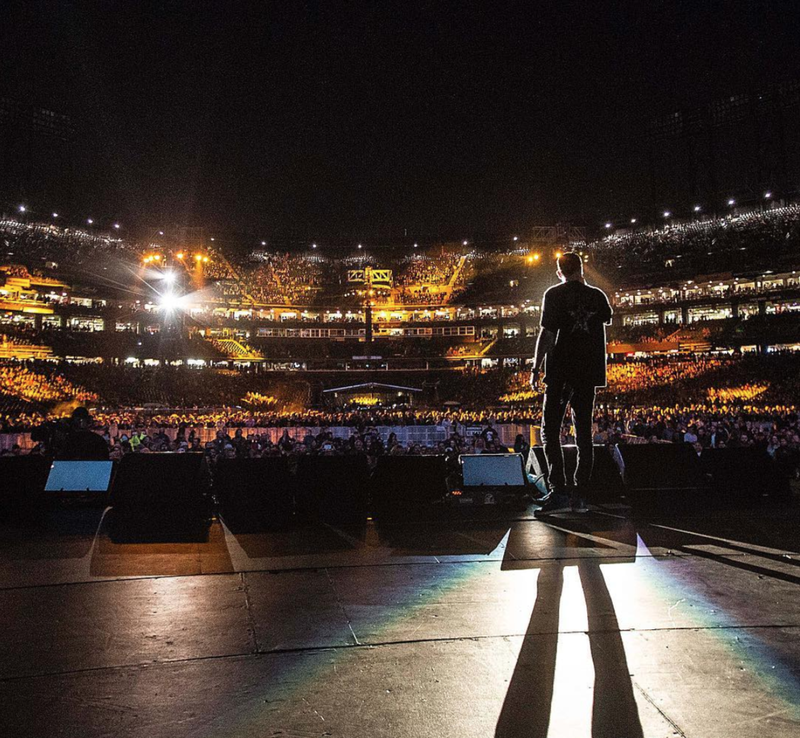 Metallica was the headliner of a bill which also included silky-voiced master of modern soul Raphael Saadiq, punk rock legends Rancid, kingpin of modern Bay Area rap G-Eazy, the tantalizing duo of Dave Matthews and Tim Reynolds and Dead and Company (½ of the psychedelic rock forefathers The Grateful Dead with John Mayer, Oteil Burbridge and Bay Area music veteran Jeff Chimenti). The AT+T stadium PA announcer started the event by welcoming the crowd and a saluting to the “bravery and determination” of the first responders, volunteers and other key people who kept these tragic fires from having an even worse impact - reminding us, “When we band together, we are more powerful than any one of us alone.” She also reported the great news that “Napa and Sonoma are open for business!” After multiple blessings were brought forth by various faiths (coordinated by the San Francisco Interfaith Council) a brief mournful chorus of Leonard Cohen’s “Hallelujah” was delivered in duet style. Then we heard some harrowing first-hand accounts of people who dealt directly with the horror of these fires. Oakland native Raphael Saadiq was the lead-off hitter for the stunning musical lineup of the evening. His band set the table with a jazz/funk fusion instrumental, keyed on the lead guitarist’s sweet tone and judicious licks. An oh-so-gradual build landed in a 70’s fusion-informed soul groove before elegantly settling back down to quietness - providing an ideal prelude to Saadiq’s entry. 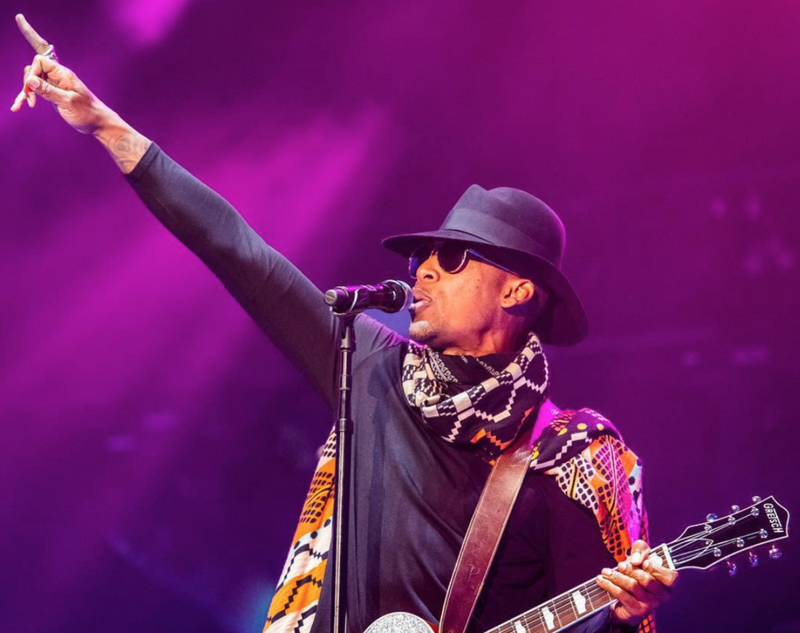 Saadiq, who toured with Prince as a bassist, took the stage with guitar in hand, clad in black except for a brown and black cape that looked as though it could double as a nice throw rug. The band kicked into “100 Yard Dash” from Saadiq’s third solo record The Way I See It. Funky bass lines and peppery keyboard inputs drove the song at first. However, the sunglasses-bespeckled Saadiq took over with his powerful but warm vocal, eventually crooning,“you got me runnin' so fast” several times, with increasing urgency. The band tore two songs from his 2011 release, Stone Rollin’ - first the hard-driving “Heart Attack,” then the harmonica-enhanced classic soul-vibed title track. Saadiq’s timeless voice was on full display for all three of these songs. Even though he chose not touch his material from his days with the legendary Toni, Tone, Tony! or the supergroup Lucy Pearl, he still exemplified why he is considered one of the great artists in soul music today. Alameda County’s Rancid would follow, and they appropriately opened their set with “Radio,” a song they co-wrote with Green Day’s Billie Joe Armstrong. Billie Joe was among the many celebrities who appeared in the video segment immediately before this set. Guitarist Tim Armstrong (no, he and Billie Joe are not related) brought forth palpable sincerity as he sang, “when I got the music, I got a place to go” through his mountain man beard. His guitar mate Lars Frederiksen emphasized the final note of this opening number with a punk-tastic leap. The band charged through their set which included their Desmond Dekker name-checking ode to reggae “Roots Radicals,” (which also references the San Francisco Bay Transit Masonic “43 Bus” which runs not far from where this event was). Sticking with the Bay Area theme, they took us on a “Journey To The End Of East Bay,” harkening back to the band’s early days as an aspiring San Francisco punk band. They have a great new record out called Trouble Maker, and those lucky enough to see them on their Summer Tour with Dropkick Murphy’s were treated to many of these songs. However “Telegraph Avenue” would be the only one performed tonight - but it was made even more special by Frederiksen pointing out his parents in the audience beforehand, and the webcast quickly training its cameras upon said parents! The band powered through their final two songs, 90s rock radio staples “Time Bomb” and “Ruby Soho.” The entire set was brought forth with impressive alacrity, even the final two widely adored songs - each of which the band has surely performed several thousand times by now. Rapper G-Eazy took the stage next and brought his James Dean looks and shamelessly sexual lyrics front and center. The Oakland rapper clearly can turn a phrase, and has won a ton of fans as a performer and respect as a producer. He took the stage to “Far Alone” and then jumped into the at times humorous “I Mean It” during which he reminded us of, “skinny rich girls always askin’, ‘where the yay at?’” "Buddha" offered a window into his forthcoming cd, The Beautiful and The Damned, which will be released just over a month after this show. Sure there were moments of rap frustration - annoying and cliche air horns, lyrics drifting too far toward the sophomoric, and ridiculous bragging about female conquests. He certainly did not mince words expressing his displeasure with our president’s "or his perceived lack-of" response to these fires before galloping through an audience participation-enhanced version of, “Calm Down.” This, “Some Kind of Drug” and the set-closing “Me, Myself and I” represented G-Eazy’s When It’s Dark Out release well. He also delivered “No Limit” (his collaboration with Guatemalan-American producer Carnage) featuring the ear-tickling “Rihannah/Benihana” rhyming scheme, and his collaboration with Marc E. Bassy “You and Me” (and yes it was funny when Matthews soon afterwards sang a song by the same title). While Dave Matthews is clearly the more well-known of the Matthews/Tim Reynolds duo, Tim shined brightly from the very beginning of this set. A gorgeous prelude to a haunting “Don’t Drink The Water” found Reynolds offering a variety of embellishments between Matthews’ articulately delivered vocals. When Dave moved briefly to Woody Guthrie’s “This Land Is Your Land,” Reynolds adroitly produced an ideal effect. During “Warehouse,” it was Reynolds’ acoustic playing that was captivating. During “Satellite,” he laid in the weeds and waited for just the right moments for a well-placed effect here, or an effortless flurry of notes there. The introduction to “Bartender” came off a tad overwrought, but the song took on the feel of someone looking for something more spiritual than alcohol from a bartender, particularly given whom this concert was benefiting. Matthews kept referencing to his portion of the show as the “quiet between the music,” but his set was very strong musically itself, and his stirring delivery of the despairing “Grey Street” made sense as a closer. The song truly blossomed when Chimenti’s most intriguing solo of the night wound up encouraging the band to join in and build to two different crescendos. “Not Fade Away” gave the drummers, Mickey Hart (wearing a hat honoring fire-fighting first responders) and Bill Kreutzmann (wearing a hat honoring The Giants) each of The Grateful Dead, a chance to flex their muscle. Mayer, Burbridge and Chimenti also made good use of their last moments to shred without the confines of structure. Despite some rough spots, “Touch Of Grey” served as the most event-appropriate song of the set given its familiarity, not to mention the “we will survive” chorus which brought the set to a celebratory close. Metallica took the stage explosively with “Hardwired,” the song which was the last recorded for, and which contains the title lyric of their most recent cd, Hardwired…..To Self-Destruct. Then they brought us back 33 years to the band’s Megaforce Records days with a soaring reading of “For Whom The Bell Tolls,” from Ride The Lightning. The absolute shreddery Kirk Hammett brought forth here, followed by the mesmerizing quiet guitar section which preluded “Fade To Black” together served to demonstrate Hammett’s impressive range. This song, and “One” later in the set each spoke to themes of hopelessness and tragedy which sadly are probably very real to wildfire victims right now. Lead vocalist James Hetfield’s artfully anguished growl was most fitting on these songs. The band gathered as one itself at the front of the drum kit as they brought “One” to a close. “The Memory Remains” gave me assurance that Lars had eaten his now famous energy-providing pancakes, as he powered the band through the lead single from the band’s 1997 release ReLoad. The “wo-wo-woaaaah” portion that Marianne Faithfull sang on the original studio version was delivered ably by the enthusiastic crowd as the song faded to its conclusion. After they took the crowd on the journey that is “Wherever I May Roam,” Hetfield spoke to the crowd about “getting heavy,” ultimately exhorting that “Metallica gives you heavy baaaaa-baaaaaay” before launching into an intense take on, “Sad But True” which contained some classic Metallica twin lead guitar. The band also treated the crowd to strong versions of some of its most famous songs “Unforgiven,” (featuring another superb Hammett solo), the intriguing “Master Of Puppets,” a gripping “Nothing Else Matters” and the force-to-behold “Enter Sandman” which closed the evening. The webcast was brilliantly shot, and between sets we were treated to videos and first-hand stories of people who experienced these deadly wildfires firsthand. Also there were celebrity cameos like sports heroes Buster Posey (a man who like this podcast, is a Georgia native) and Joe Montana.